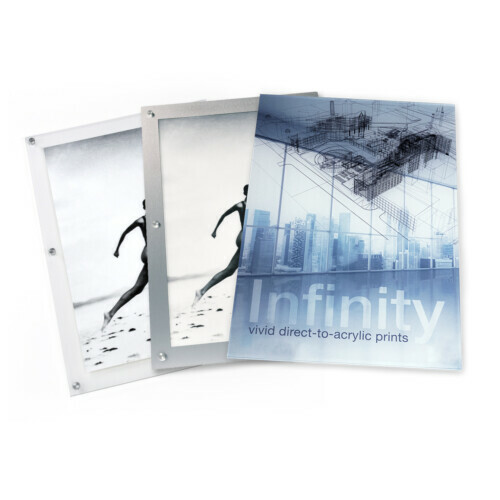 Upgrade to the Standard Fine Art version to display your image with an aesthetically pleasing acrylic mat and a clear sheet of Mylar backing for archival applications. 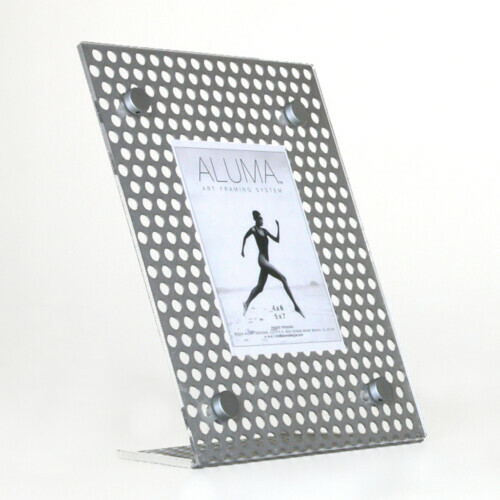 ALUMA’s flagship product is the patented architek art framing system based on a main structure of perforated high-grade aluminum combined with other contemporary materials and hardware. This art framing system presents a versatile way of framing any media to be displayed. Easy assembly & onsite image changes. 9 sizes, you can frame almost anything. ALUMA Designs’ modern picture frames will complement and differentiate the walls of any modern home or office. 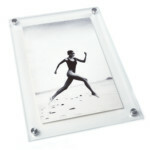 Our ready made modern picture frames are pieces of art themselves. 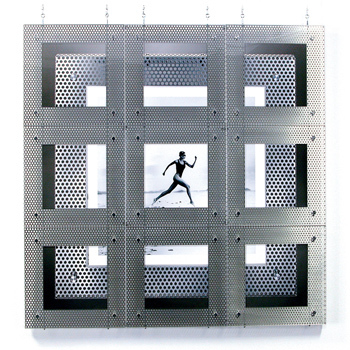 These unique contemporary picture frames are constructed of high-grade perforated aluminum and present a versatile way of framing art and pictures. Our modern frame system allows for pictures to easily be interchanged without any hassle. 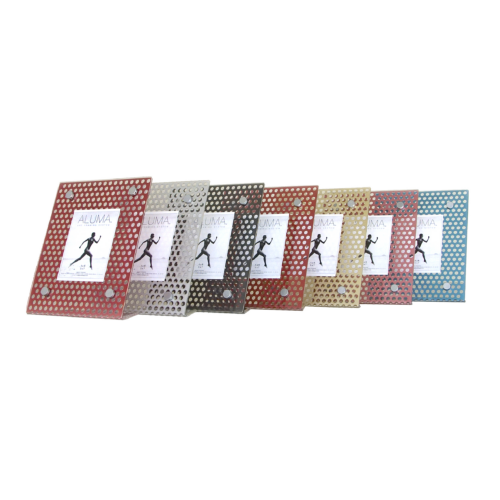 Although contemporary in design these modern art picture frames are designed to compliment the hospitality, corporate, commercial, and residential environments. Let us help you with your modern and contemporary art framing needs. Create Unique Multi-Panel Modern Art Framing Designs. Using our patented Architek Modern Art Framing System you can easily design and build a high impact Multi-Panel Art Framing System to meet all of your artistic or corporate design needs. Frame single or multiple images to create dynamic art designs. Using 9 standard sizes, create limitless Multi-Panel art designs. Affordable Multi-Panel design services and consulting available. Turn-Key Multi-Panel Design Services Available. Using your digital files, ALUMA can print and build an affordable Multi-Panel Modern Art Framing System that will rock any wall. 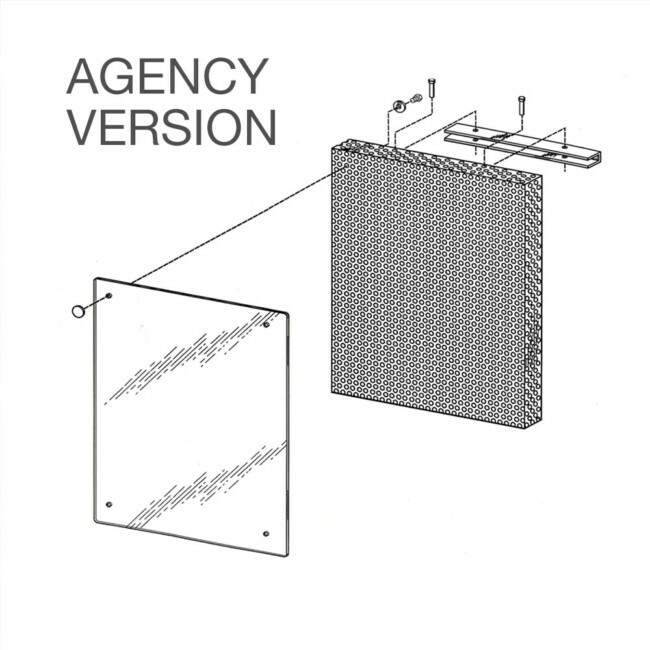 Contact ALUMA to find out how we can help you design your contemporary multi-panel picture framing system and all the unique designs possible. For commercial environments and businesses of all sizes, Aluma’s display systems can be customized for any size interior sign, document or compliance poster. Architek industrial metal wall frames create a modern high-end look for your business from the sleek plexiglass display to the industrial stand-off hardware. Inspire your employees as well as your current and future customers by putting your brand, key values, vision statements or compliance policies on display. 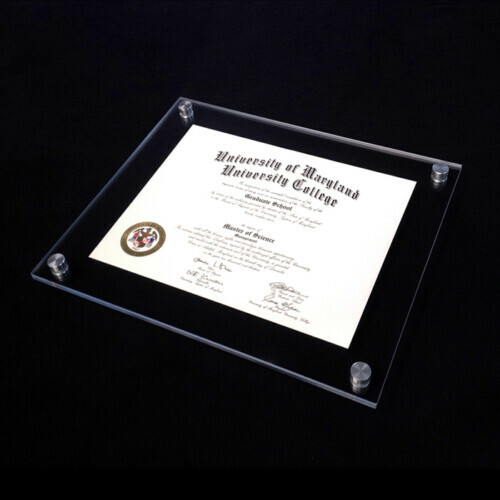 Featuring quality 1/4″ plexiglass, these bespoke frames are perfect for commercial environments. Our full service graphics & printing department can help you with all your project’s logistics. High Tech Silver Photo Frames For The 21st Century! 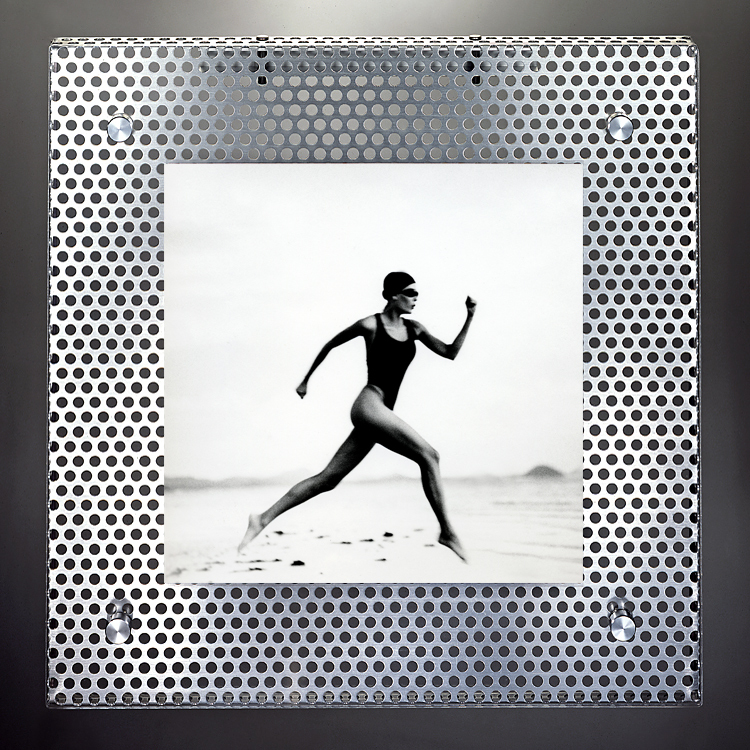 Aluma’s perforated metal Industrial pictures frames are the perfect solution for any company or residence looking to make a modern statement. 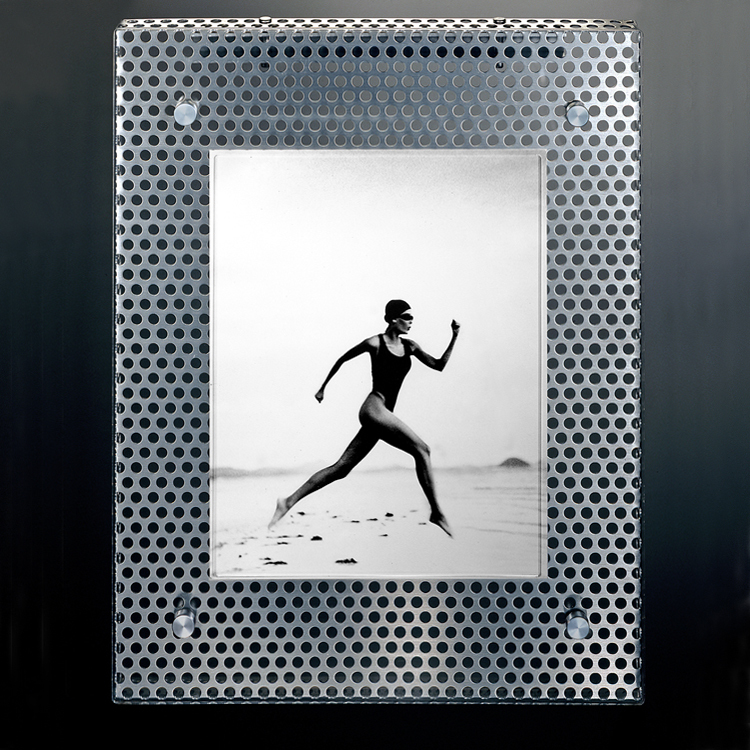 These modern silver photos frames are hand crafted using the highest quality perforated aluminum and acrylic. The Architek frame is a cut above the rest when it comes to industrial picture framing and is perfect for the Sports, Aerospace, Automotive, Manufacturing and Construction industries display needs. Meticulously finished with exquisite fabrication and attention to detail you will not find a better industrial picture frame system. Keep your latest and greatest projects on display with easy onsite image changes. Aluma’s Architek Industrial metal wall frames bring a modern sense of style to any interior. From commercial to residential spaces, these perforated silver brushed metal photo frames allow your pictures to pop with a style that ushers your guests into the future. 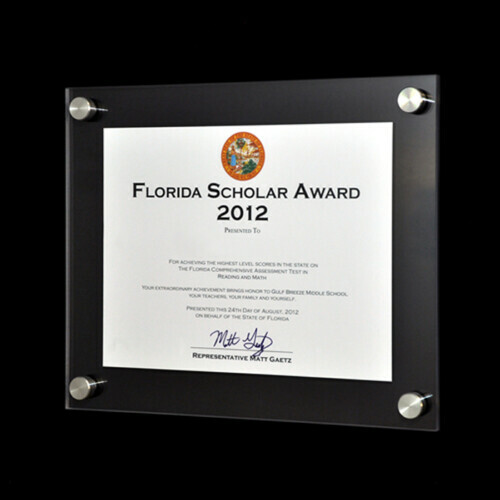 Hand crafted in the US these silver photo frames are great for displaying your latest projects, art, motivational posters, interior signage, recognition walls, awards, or diplomas. 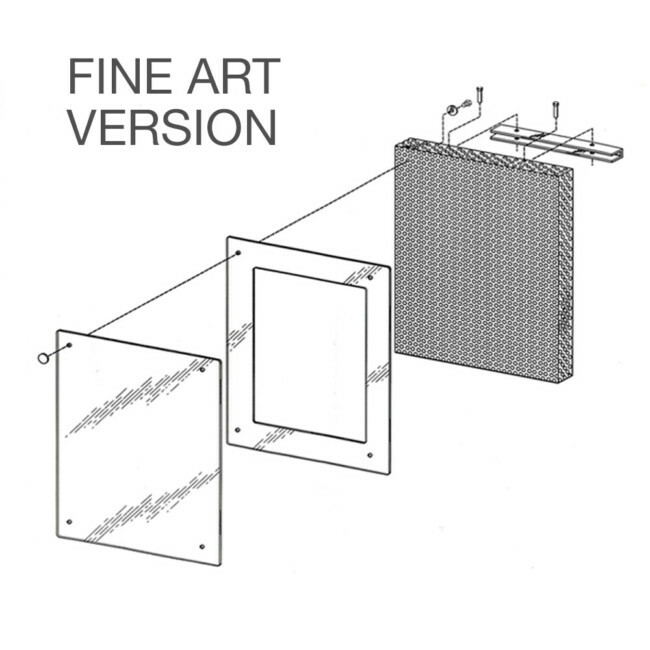 Use our patented architek modern picture frame system as a stand-alone modern picture frame or combine multiple modern picture frames to create unique multi-panel systems and/or modern architectural walls. These unique contemporary picture frames and architectural products are constructed of high-grade perforated aluminum and present a versatile way of framing art, pictures and flat panel TV’s. Aluma designs offers a turnkey service in that we can design, print, build, frame, and ship our modern image display products directly to you or your clients with simple easy to understand installation instructions. The ALUMA architek frame is available in two versions, The Agency and The Fine Art. 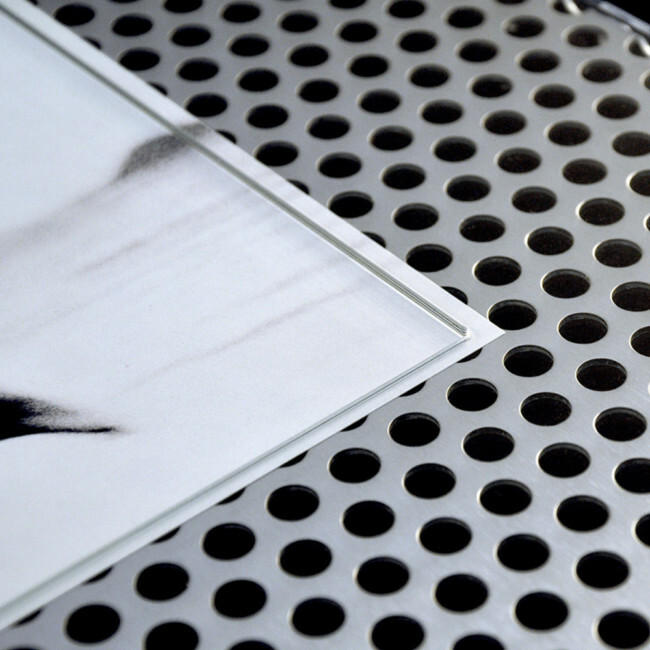 Custom Fine Art mats can be cut and polished to your exact media’s dimensions. The Agency Version has a single layer of acrylic, which presses the desired media being framed directly against the aluminum base. This allows for quick and easy framing and reframing of various sizes of media in the same architek framing system. The Fine Art Version comes with a precut clear acrylic mat which keeps the top layer of acrylic from touching the media being framed and also adds depth to the look of the framed media. 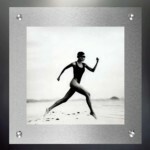 A clear sheet of Mylar backing is provided with all fine art frames for archival applications. Print purchase includes free mounting of prints in frames so they arrive ready to hang. Choose from our selection of printing options. Opening a new era in color performance. Epson is once again raising the standard for pigment ink performance with Ultrachrome HDR (High Dynamic Range). Featuring two extra colors – green and orange – Epson Ultrachrome HDR provides a much wider tonal range. This means higher color accuracy, greater subtlety and smoother gradations. More vivid, natural and dazzling. The addition of orange and green inks takes inkjet color performance to an entirely new level. Grass and foliage will be much more vivid and natural, while orange tones like sunsets will be more dazzling. Photographers will be delighted to see that the orange ink also lessens the graininess in skin tones. Epson Ultrachrome HDR will give you quality unlike anything you’ve seen before. Choose between 1/4″ and 1/8″ acrylic front. The 1/4″ acrylic front is a 20% upgrade. Hardware size is purely subjective. 5/8″ hardware is more proportionally suited to smaller frames while 7/8″ works well with larger frames. Videos featuring this product are coming soon! 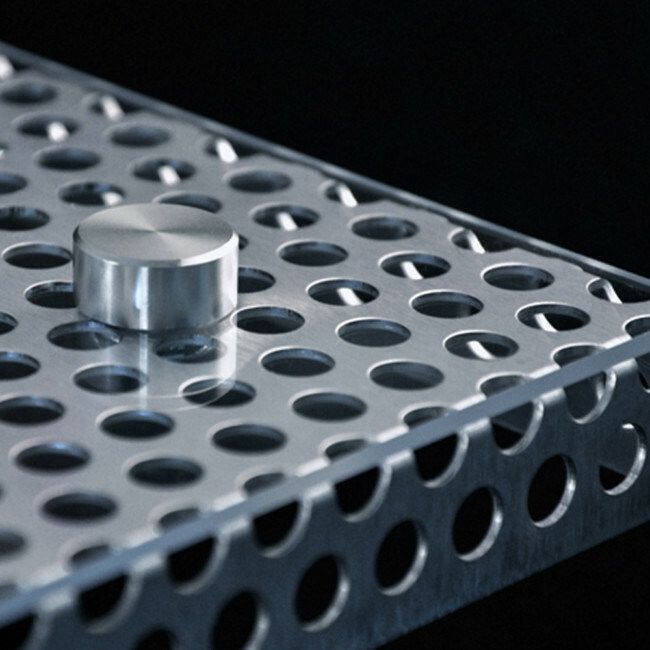 What is the production time for Architek Metal Frames? Example: Select (3) 8×10 Vetro Stand-Off frames and (7) 15″x18″ Vetro Stand-Off frames and receive a 10% volume discount off your Vetro Stand-Off order.